• 38H" x 20W" x 20D"
If you're aiming for elegance in your showroom, then there's no better way to deliver than with our Metal Framed Display Cases. 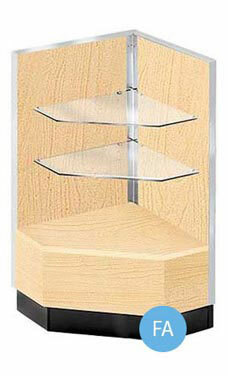 To tie your display units together, the Metal Framed Open Front Corner Filler will do just the trick. It puts space to work featuring a 90 degree triangular design with two adjustable shelves to allow for additional display. The corner filler also features a long wearing melamine laminate and satin maple finish with anodized aluminum framing to add class and elegance to your display presentation. It's perfect for creating the custom built-in look you've always wanted. Crating for secure shipping is included in the price of the case. Overall measurements include 38"H x 20"D x 20"L. Fully assembled and ready to ship.